Earls Colne in the heart of rural Essex. involvement in the farming and dairy industries. customers, enabling us to gain a close insight into their preferences for our products." in flavours most popular with customers. luxury food we share with our customers." Channel Islands milks and creams are blended with a real fruit for a uniquely satisfying taste that lingers delightfully. They have an indulgent creamy taste, yet refreshing. Our Production processes are proven to eliminate fat while retaining protein. 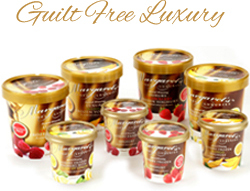 Gluten free and containing less than 3% fat our frozen yoghurts provide the healthy option to ice cream. Ideal for vegetarian diets and suitable for coeliacs, our yoghurts contain pro-biotic cultures and are totally free of artificial GM. Customers select from a range of popular luxury flavours, - mango , raspberry, strawberry and one which has just a hint of lemon. Stored at -18°C below they have a shelf life of over 12 months. For added convenience products are available in handy 120ml pots with a spoon under the lid. A range of 480ml pots are now available. Margaret's frozen yoghurts are prepared under strict quality and environmental controls. Our dairy has been awarded the coveted BRC Control Standard 'A' food at the highest standard accreditation. At least three teams of expert judges in a blind tasting awarded coveted single gold stars to our delicious raspberry and strawberry yoghurts and a double helping of two gold stars to our hint of lemon frozen yoghurt. Powered by JLA Computer Services Ltd.